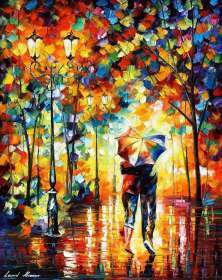 Leonid Afremov’s online gallery is full of absolutely beautiful original and stunning abstract art for sale. Among hundreds of breathtaking landscapes and seascapes, fascinating cityscapes, masterfully painted portraits and paintings of animals even a picky person with the most sophisticated taste will be able to find a piece he’ll want to buy. Every single piece in his collection of art is unique, so you can be sure that there’s nobody else who owns exactly the same canvas you do. A certificate of authenticity will be delivered with your name on it which will be signed by the artist himself. If you are going to give a painting as a gift to your closest friends, family members or dear colleagues, please don’t forget to mention their name and address for delivery. As a pleasant bonus, our delivery to any part of the world is free of charge. You can order a painting rolled in a tube, or for just an extra $29 it will be wrapped and stretched on a frame so that you could hang it immediately after receiving. We can assure you there’s no better place if you are looking for unique artworks for sale. 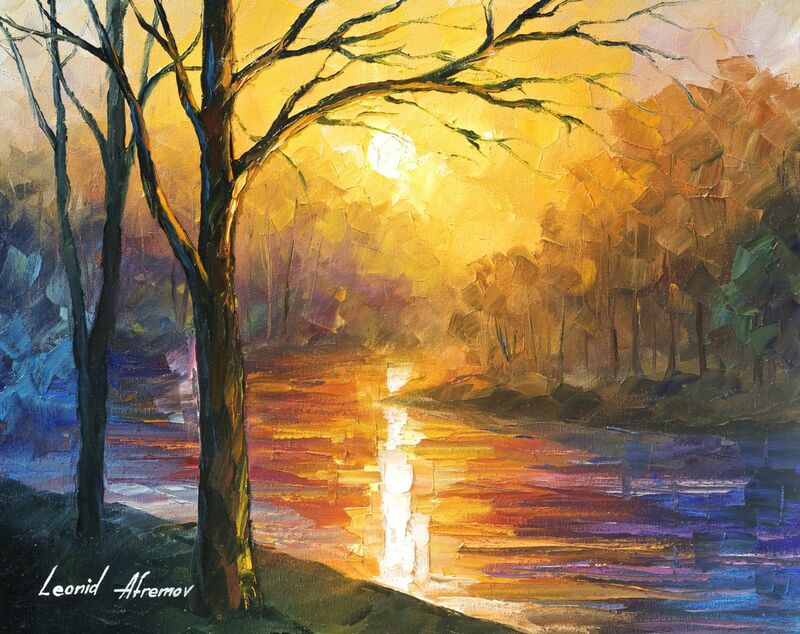 What do you see when you look at this terrific Afremov’s painting called Yellow River? The artist depicted a peaceful bank of river, two dark silhouettes of trees on the foreground, blurry outlines of the forest on the background, and of course the sun of an outstanding beauty. What makes the sunset look so special? There’s no need to mention a few minutes of all that spectacular extravaganza of colors in the sky. It especially looks gorgeous near the water as it’s reflected like in a giant mirror in its clear and peaceful surface. When do we usually have a chance to watch the sunset? The answer is obvious- in the evening. It’s the time to sum up your day. Did you bring yourself happiness or sadness? Did you do some good for someone or disappoint that person? Evening is the time to think of something philosophical like the beauty of the world, the eternity of the Universe and our place in it. No matter how busy and tiresome your day was, if at the end of the day you watch such a great performance of the sun, it can make you forget about all of your problems and worries. No surprise that so many artists, writers and poets have dedicated their works to this beautiful phenomenon. Where will this painting look best in your interior?